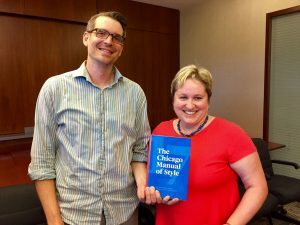 Seven years and countless changes to every aspect of writing, editing, and publishing* after the 16th Edition, the 17th Edition of the Chicago Manual of Style has arrived in all its glory. 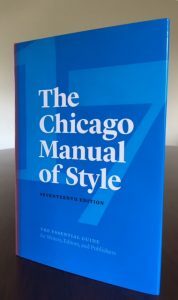 Blue and beautiful, this behemoth more than any other book we publish is the product of teamwork. 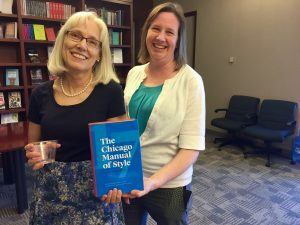 It may not take a village, but it does take a whole publishing house. So we thought we’d share a few photos from a birthday party we just held for it. 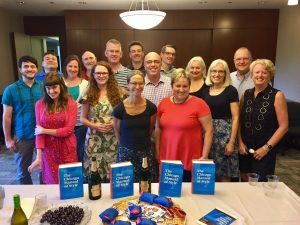 Those are the smiling faces of people who have just proudly set this book off on its journey to the desks of writers and editors all over the world. *But not to the serial comma. We’re not monsters.